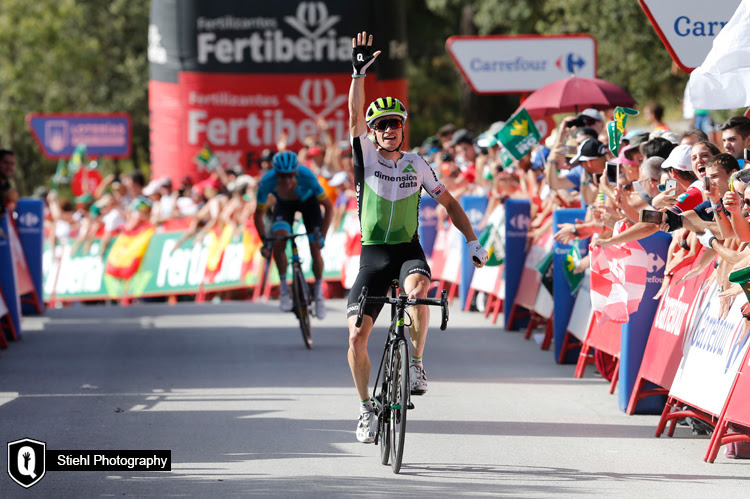 Benjamin King stormed to victory for Team Dimension Data for Qhubeka on stage 4 of La Vuelta a Espana. The American was able to outsprint Nikita Stalnov (Astana Pro Team) and Pierre Rolland (EF Education First) after spending all day in the breakaway. Today's stage of La Vuelta was 161,4km, running from Vélez-Málaga to the summit finish atop Alfacar, Sierra de la Alfaguara. An early attack saw King make the break of the day with eight other riders. The first climb of the day was a category one climb up Alto de la Cabra Montés and the break was allowed to extend their lead to over 9 minutes. King was the best placed on GC of all the riders in the break and therefore was the virtual leader of the race for the majority of the stage. With 20km to go, it became apparent that the break would decide the stage as they had kept their 9-minute lead in tact up to that point. With 15km to go, King countered an acceleration that was made for the intermediate sprint point and went into the lead with Stalnov and Jelle Wallays (Lotto-Soudal). The trio started the final 12km climb with a 30" lead over their chasers. Wallays soon lost contact as the road ramped upwards with King pushing the pace early on in the climb. Rolland broke from the chasing group in a bid to catch King and Stalnov and came within sight of the leading duo, inside of 1km to go. King had raced a smart final climb though, and measured his effort well to still have more than enough left in the tank to launch his sprint with 200m to go, and take an incredible grand tour stage victory. Ben King- Rider I'm still in shock. It's a dream come true. It's been my goal for the last couple of years to win a grand tour stage. But even just to be here and have the opportunity to go in the breakaway today is an honour, for the faith that the team put in me. We have been working really well together as a team and I've also been working really hard for this at home, so it's really affirming that it all worked out like this. I didn't think that the break had a chance to stay away, until 40km to go, and even then, there were really strong riders in the break with me. I just did not know how to expect to stack up with those guys. I just put myself in the right position to have the best chance possible and I hit them early at the bottom of the climb and then time-trialed to the top. I was able to out-kick Stalnov at the finish. It's no secret it has been a difficult season for the team this year but the atmosphere on the team is great. We believe in what we are doing and the potential of the team. We are motivated everyday by what the team is doing for Qhubeka, raising awareness and so to get a victory like this, I know that winning races contributes to more bikes being donated to Qhubeka so it's an honour to be racing for such a noble cause and certainly extra motivation for us.